Craft Beer is everywhere in BC and Whistler is no different. 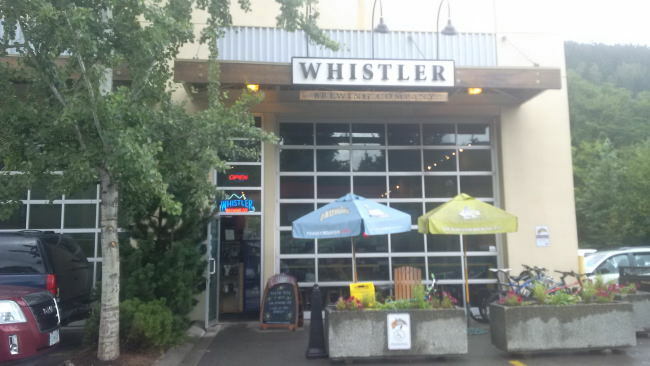 Whistler Brewing is located in the Function Junction neighborhood of Whistler. There was a time when the brewery was Alberta owned by a bigger brewery but it has been locally purchased and the entire operation is now located back in Whistler. The brewery is located in a commercial district with lots of warehouses (I didn’t realize this area existed). When you arrive at the brewery you are welcomed by a nice taproom with some hot food options, merchandise area and a cold beer store. You can sit down and have a glass or two of beer or try samples of their beer. You can even fill a growler to go. For around $15 you can do a tour of the brewery which includes 4 samples of their beer. Three samples are predetermined and the last one your choose after the tour back in the tasting room. It is a very informative tour especially for people that do not know the brewing process and industry as well as I do. I recommend taking the tour next time you are in Whistler if you want to learn more about beer. I was surprised and happy to hear that all beer production was moved back to Whistler and also surprised at how small the brewery was. I would like to thank the Staff at Whistler Brewing for all the hospitality. The brewery is well run and is making some tasty beer and is well worth a trip if you happen to be heading to Whistler be it for a weekend, hiking or skiing. This entry was posted in Brewery and tagged bc, beer, brewery, canada, craft beer, craft brewery, taproom, Whistler, whistler brewing company. Were they brewing Chestnut Brown yet? Hey Terry sorry I missed this. I didn’t notice but I know it wasn’t on tap yet.